Do you recall the kind of book you lost yourself in as a kid? The one you'd stay up all night reading? Welcome to the grown up version of that book. To say I love Spooner, the book and character, is such an understatement. I'm struggling to recall a character I've loved so much. The early works of John Irving – Garp in particular – are comparable, but still Spooner stands alone. Is he like Huck Finn? In some ways. That comparison (made by another reviewer) is astute. 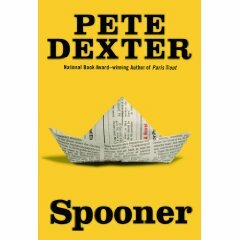 But unlike Huck, Spooner not only gets into trouble, trouble sticks to him like glue without his having knowingly done a thing. And he sits by and watches, while the world falls down around him, seemingly unmoved. It's as though he's watching someone else's life go by, and he's only mildly concerned. Who couldn't love him? How any writer can create a character so seemingly naive, yet at times calculating, is astounding. Then, he also creates minor characters who are well realized. The whole mix, with pinches of drama and comedy added as needed, make this the kind of book you can sink your teeth into. You want to read it all the way through, but you don't want it to end. This is what is called a thumping good read. It's an old fashioned great read, the kind we hope to find yet hardly do in contemporary novels. There's comedy and drama, outstanding characterization so good the plot itself hardly matters, and so much depth and heart. I would recommend this book to any reader who really loves the novel, the standard kind that exists to transport you without any attempt to be inscrutable or modern in the sense of experimentation with style. This is akin to the sorbet you read to clean your reading palate. It is, simply, wonderful.